Is Your Pool Maintenance guy Killing You? Do your eyes burn and swell up when you go in your pool? We have recently been having problems with skin and eye irritation in our pool, for the second time. Whenever we went in the pool our eyes would swell most of the way shut, it was quite painful. Also the water tasted like putting your tounge on a battery. The first time, we were converting to a salt system because we were convinced that the chlorine was burning our eyes. As soon as we installed the system and powered it up it said that there was too much salt in the pool. We hadn't added any salt yet, thank goodness. So we went in and got the float style salinity tester for our aquarium. The pool was reading 6800 ppM! The chlorinator uses 2800 maximum! The weird thing was that we had never added salt to the pool. That's when I got an idea. I thought that lye (NaOH) in the pool tile soap was reacting with free chlorines and making salt (NaCl) and letting the OH- bond to water molecules making the pool Basic (alkaline). That idea got us on the right track, the tile soap. We drained the pool and told the pool guy to stop using the soap. Then we filled it back up added a little salt and the pool was great, it didn't smell like chlorine or hurt our eyes. Soon after our success we left on a summer trip and were gone a few weeks. When we got back it seemed like the pool was never fixed, it smelled like battery acid. Today We did some more research and I did some chemical tests to prove my hypothesis. I was right about the cause the first time, but this time it was a different chemical property of the soap causing the problem. The soap contains a chemical called Ethylene Oxide because of it's algicidical properties. Ethylene Oxide is close relative of Ethylene Glycol, it's polymer version, propelyene glycol is the main ingedient in antifreeze for engines. A few drawbacks of this chemical? Oh nothing, just that it causes skin and eye irritation and best yet it's a carcinogen! I bet your pool guy didn't tell you that! (Skin and eye irritation are listed right on the datasheet for the soap! It also mentions that "Ethylene Oxide causes tumor growth in labratory animals" Nice.) It can be found here. Pool Soap Material Safety Datasheet Just go to page 2 for health information. 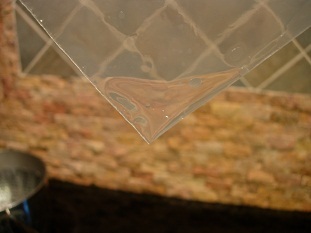 This chemical is used because it forms a film on the top of the water and protects the tile when waves hit the sides of the pool. This is how I can Prove my new hypothesis: Ethylene Oxide would lower the freezing point of the water just like antifreeze, so I did an experiment to test this. During the process of planning the test I realized that i would need to boil the water to remove any dissolved solids (mainly salt) from the situation. 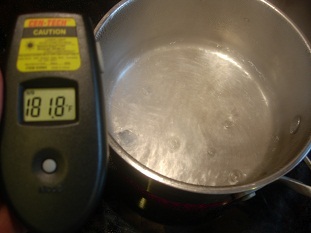 Meaning that duing the process of boiling the water I could test the boiling point (which would be lower as well). 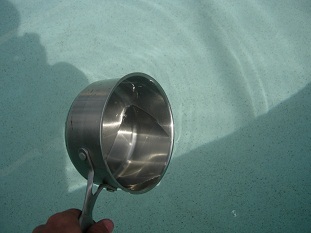 Obtain a sample of your pool water in a small cooking pot. you only need a little bit, any extra will just make it take longer to boil. try for something between a 1/2 cup and 1 cup. 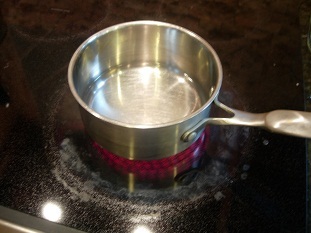 Now take your water sample inside and bring it to a boil on the stove. The Boiling Point of the water seemed way too low. So I boiled some Water from the hose that we used to fill the pool. the boiling point seemed normal. 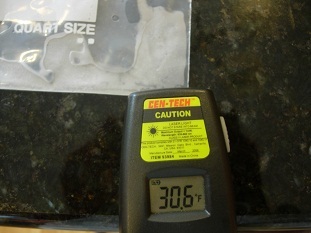 But I at least knew that the other sample was boiling low and it wasn't a thermometer malfunction. 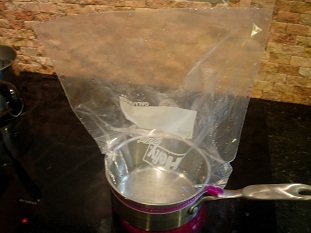 For each of the samples I collected steam in plastic bags so that I would have the water and anything in the water that has a boiling point below that of the water. 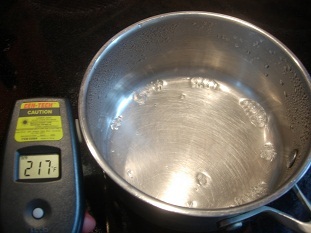 I didn't need very much water for the freezing point test but it required a lot of steam. While your samples are in the freezer... 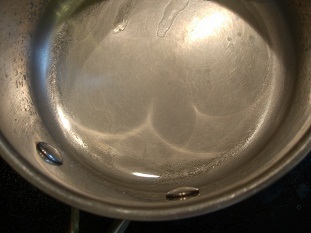 I also just out of curiosity tried a test on the remaining solids in the water after it was boiled. Immerse your burner wire in the remaining water and stir it around. Now light your propane torch. 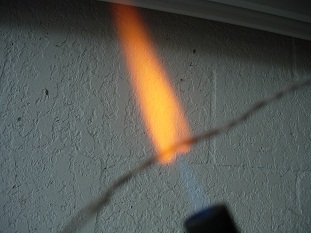 hold the burner wire at the tip of the flame and you will notice that the flame changes color after passing the wire. Warning! If your flame changes to anything other than orange or yellow get as far away as possible from your pool and call a lawyer, maybe call poison control too. Orange/yellow is the color that table salt (NaCl) and many other salts burn, so we expected salt; however some salts containing metals such as potassium will burn amazing colors. One thing you can try at home is copper salts, or in this case copper oxidization or similar corrosion produces a salt like substance. So thats what we'll use. 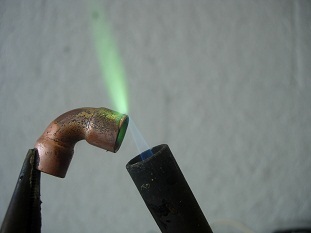 Find a piece of oxidized copper and hold it with pliars in front of your torch. Pretty cool but lets get back to our lab. Time to check our frozen samples! 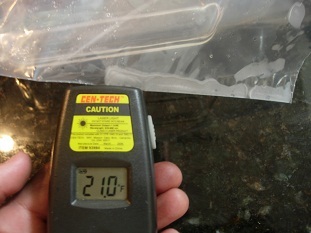 The regular water was frozen around 30 degrees F. I would say that is good evidence of an ethylene based compound in the pool water. But what does this all mean? As cited by OSHA; "Unfortunately, EtO (Ethylene Oxide) possesses several physical and health hazards that merit special attention. EtO is both flammable and highly reactive. Acute exposures to EtO gas may result in respiratory irritation and lung injury, headache, nausea, vomiting, diarrhea, shortness of breath, and cyanosis. Chronic exposure has been associated with the occurrence of cancer, reproductive effects, mutagenic changes, neurotoxicity, and sensitization." And our buddies at the EPA; "The acute (short-term) effects of ethylene oxide in humans consist mainly of central nervous system (CNS) depression and irritation of the eyes and mucous membranes. Chronic (long-term) exposure to ethylene oxide in humans can cause irritation of the eyes, skin, and mucous membranes, and problems in the functioning of the brain and nerves. Some human cancer data show an increase in the incidence of leukemia, stomach cancer, cancer of the pancreas, and Hodgkin's disease in Humans exposed to ethylene oxide." "EPA has classified ethylene oxide as a Group B1, probable human carcinogen." Neither of those descriptions sound like the kind of chemical to put in water that you are going to swim in and possibly drink some by accident. Given the chemical properties of this substance, every time your pool guy uses it more and more Ethylene Oxide accumulates. If just a month's worth of using this product causes enough Ethylene Oxide to build up in the pool to affect the physical state change temperatures to lower that greatly, imagine what kind of concentration a pool would have in just a year! So, you don't have to take my word for it. Try the tests yourself! And make sure your pool guy isn't using deadly tile soap!